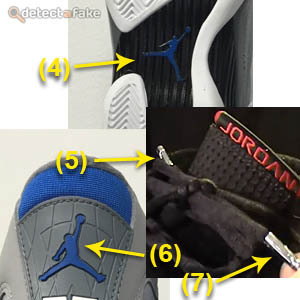 Nike Air Jordan's were first produced for Michael Jordan in 1984 and released for public consumption in 2001. 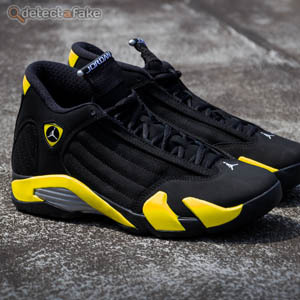 Since then they have become one of the most popular shoe ever made. 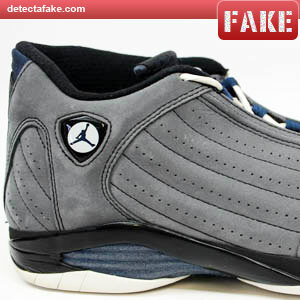 With that popularity, the counterfeit versions have become increasingly flooding the market. 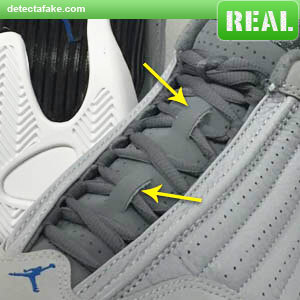 Below are a few steps to see if your Jordans are real or fake. 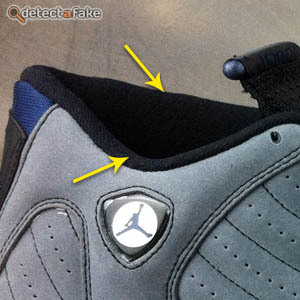 First, make sure the shoes are manufactured with the factory codes LN3 (China) or FT1 (Taiwan) stamped on the tag. Also make sure the box has the same manufacturing country. The style number is usually 9 digits long. 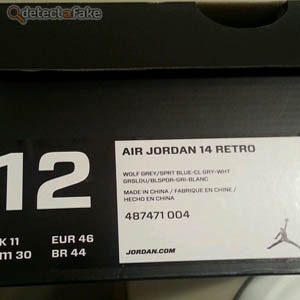 Make sure the style number on the box matches the one on the shoe tag. 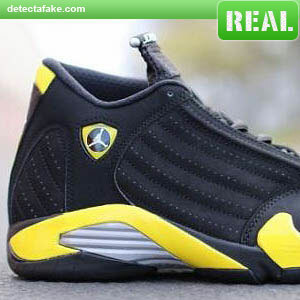 Next, there needs to be a total of 14 jumpmen, 7 on each shoe. 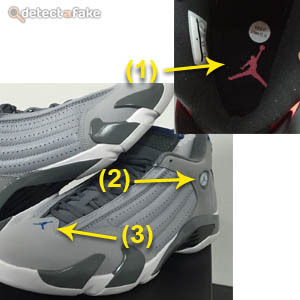 Next, there needs to be 2 lace tabs on the tongue. 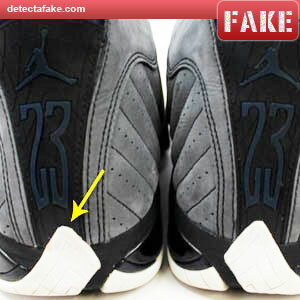 Many of the fakes only have 1, as you can see in the fake above. 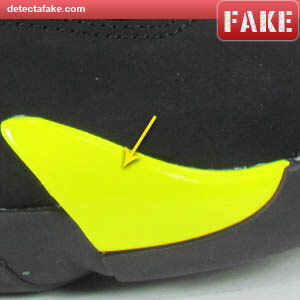 Next, look at the fingers on the side of the shoe. They should have a metallic sparkle look to them. 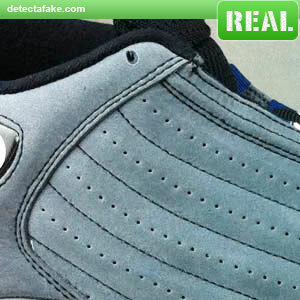 Most of the fakes are just a solid color. 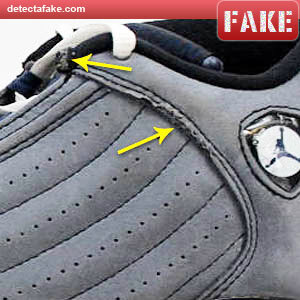 Next, look at the back of the shoe where the sole comes up the back. It should be aligned in the center, coming up towards the center of the "23". Notice that the fake one on the left is way off center. Next, make sure the "webbing" is on the rubber back panel. 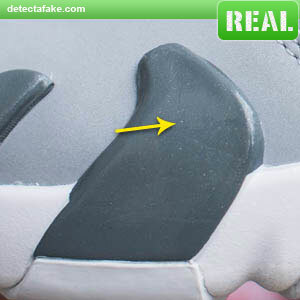 Some of the fakes are either flat or not as distinct as the one shown above. 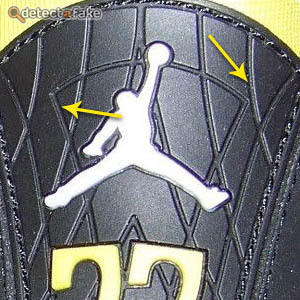 Next, look at the quality of the stitching. You should not see flaws like the fake one above. 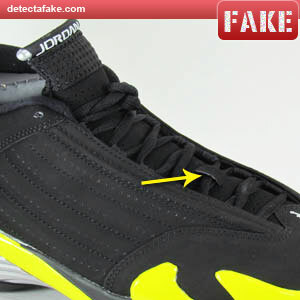 Next, look at the height of the sides around the ankles. 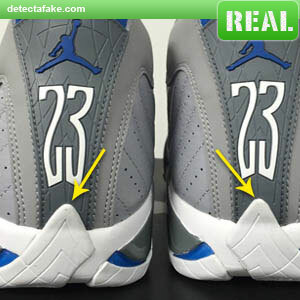 The inside ankle side should be higher than outside and the outside should be curved. Next, look at the height of the tongue. It should profile substantially above the rest of the shoe.